Since I’m trying to catch up on my knitting projects and I don’t want to bore the non-spinners with a second spinning post in a row, here’s some of my favorite links about sock heels! A Heel and Toe for Every Purpose (pdf) An overview of some commonly used heels and toes. I particularly like the “round/French heel” and use that in almost all my sock patterns. Eclectic Sock Heel – A combination flap and short row heel. Fun to knit and it looks really cool! I used this heel on one of my first patterns, the Grand Teton socks. Toe-Up Gusseted Heel – This toe-up heel places the flap along the bottom of the foot and the gusset decreases move up the ankle. I used this heel on my first sock pattern, the Shenandoah socks, although it’s hard to tell in black. Toe-Up Heel Flap – A toe-up gusseted heel with the “flap” on the back of the heel and a “gusset” made with increases on the foot. Widdershins uses this type of heel. 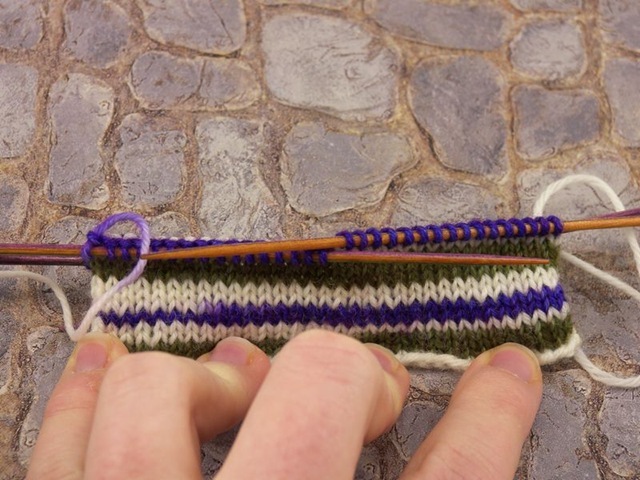 Short Row Heel – A slightly different way to do a short row heel with no wraps. Just found this one- I have to try it next time I do a short row heel! I’m fascinated by self-striping yarns, but I don’t like knitting straight stockinette stitch much. I also rarely find a self-striping yarn that I like on the market. I keep trying to get ahold of some Twisted Fiber yarn, specifically Angst in Kabaam, but I never get there before they sell out. I just realized the other day that maybe I should sign up for their newsletter to avoid this problem in the future. Anyway, I have no self-striping yarn or inclination to use it. Except that I am going to be traveling and there’s something very handy about having a simple sock on the needles to keep the hands busy while chatting with people or just for therapy. Of course, I’ll be bringing other projects because there’s no way I’m working on a “simple sock” on the 5-hour plane ride! But I’ll need a project to work on during coffee trips with my dad and after dinner chats with my mom and maybe to work on while hanging out late at night with my sisters (bad lighting + after midnight = bad for charts). I’m going to dye my own self-striping yarn. And I’m going to show you how to do it too! If you’ve never dyed your own yarn before, you’re missing out. It’s not something I want to do all the time, but it’s fun occasionally and especially with some friends. I like to use food coloring dying methods instead of chemical dyes because, well, it’s so much easier to clean up! And cheap and easy to find the supplies. I suggest reading up on the basic technique in these Knitty articles: Kool Aid Dyeing; Food Color Dyeing. Kady and I have dyed together two different times. The first time we both did the cold pour method. The second time I did the hot pour and Kady stuck with the cold pour. I dyed some Cascade Superwash with the dip-dye method by myself. All had pretty good results! 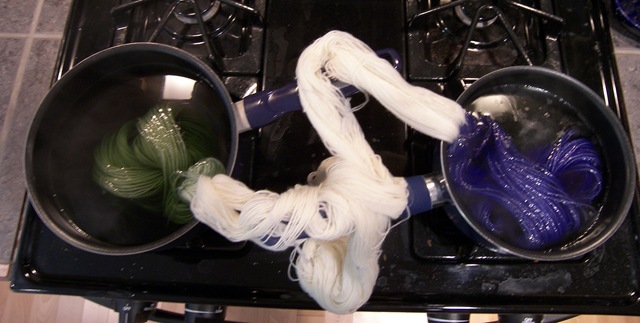 There’s a lot of set up to dye self-striping yarn, but the results are worth it. First, as with any knitting, we have to swatch. Pick your yarn, in this case Knit Picks Undyed Essential, and your needles, in this case Size 1 (2.25mm) and knit a swatch. If you’ve knit a plain sock with this yarn/needles before, you can skip this swatch. Figure out your stitches per inch (and rows, if you want). Multiply your sts/inch by the circumference of your ankle or middle of your foot. For me, that’s 8 x 9″ = 72 sts. Socks have negative ease so that they cling, so take that number and multiply it by 0.9. (That’s an easy way to subtract 10%.) For me, that’s 72 x 0.9 = 64.8. I’ll round that down to 64 stitches. Unravel Swatch 2. Find the two marks and line them up. Trim off the cast on/round 1 yarn if you want. 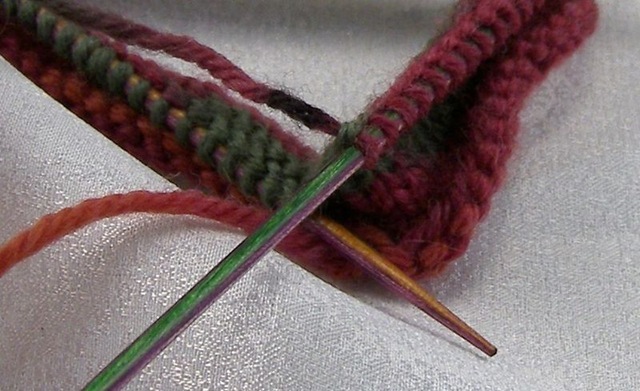 Fold the yarn between the marks into as many rounds as you knit. I knit 8 rounds, so I folded the yarn between the marks into eighths. If you only knit 2 rounds, just line up the marks. 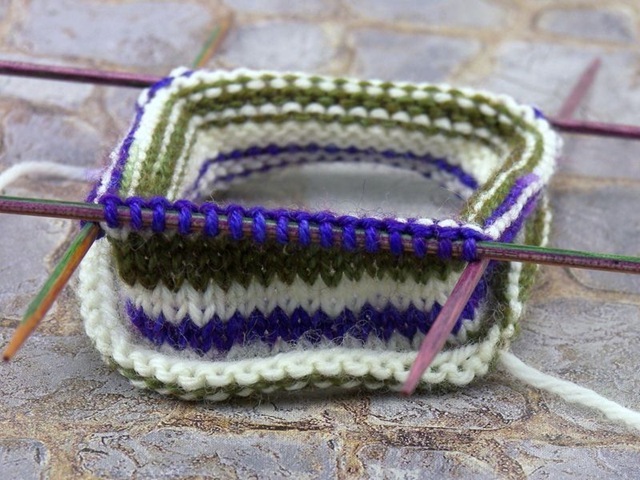 If you knit 4 rounds, fold the yarn in half once to make fourths. 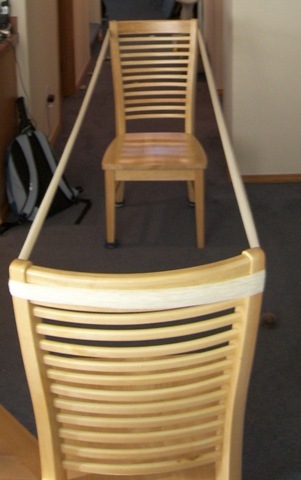 Lay the yarn against a yard stick or ruler and measure. Don’t worry if the yarn isn’t completely straight. This project involves a lot of math but isn’t an exact science. This tells you how many inches it takes to knit one round of your sock. It takes me about 24″ of yarn to knit one round of my 64 stitch sock. Adding those lengths up, I’m going to need to make my skein 240″ around. I took the skein from Knit Picks and balled it up on my swift. Ask me about the time that I tried to re-skein directly from the Knit Picks skein. Go ahead, ask me about the 4 hours I spent untangling the yarn. I dare you. Using the light colored scrap yarn (dark colors will bleed; I used some left over Mist Palette) tie the skein in as many places as needed. 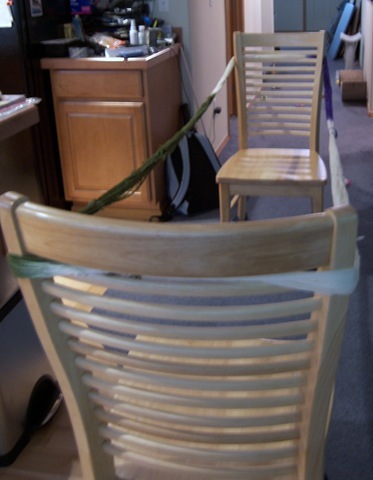 Wrap the ties loosely when tying; if you tie them too tightly, the dye won’t absorb the same as in other spots. I’m paranoid about my yarn getting tangled, so I tied the yarn in 8 places. I didn’t think about taking pictures though; the light gray yarn doesn’t show up in the pictures very well! Using a different color yarn and the same technique, mark the color segments on your skein. I was stupid and used the Mist for the whole thing. I got very confused later on. Trust me, use a different color yarn for each color segment! This is how I marked my skein, measuring along the yarn and tying markers as needed. Tie your color markers loosely, but not so loosely that they’ll slide around. I might have tied my markers a little too loose. Oh well. 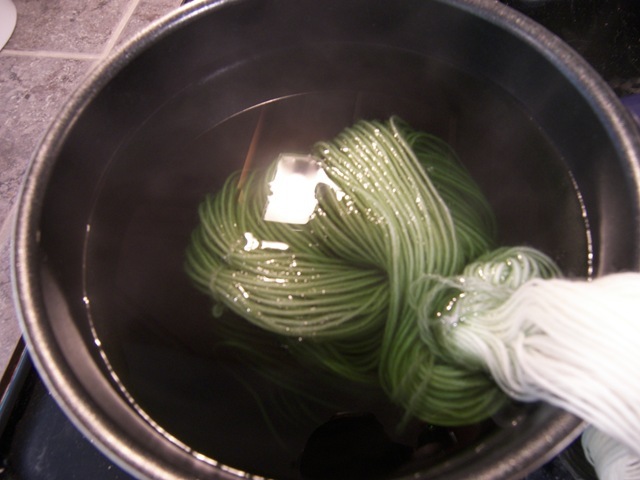 Soak the yarn in a cold water bath with a 1/4 c (60 ml) of vinegar for a few hours or overnight. (Remove from your skein track, obviously.) I don’t know if this is completely required, but I do it every time anyway. Mix the dyes as needed; I refer to this article in Knitty when mixing up my dyes. 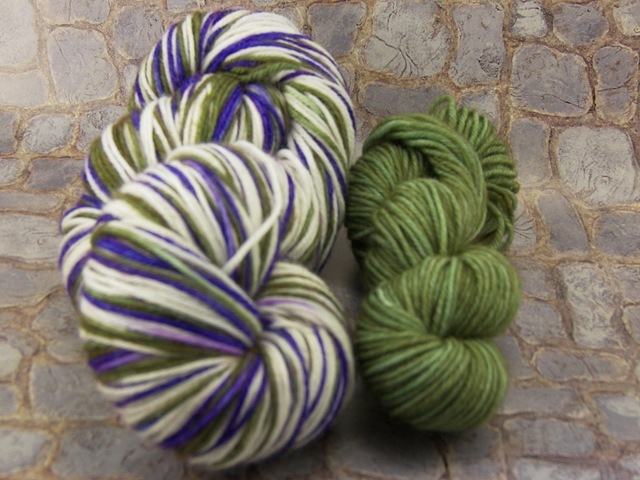 I used Wilton’s Juniper Green and Violet for this skein. I dissolved the dyes (quite a bit of dye… more than I needed, I think) in big pots of water and brought to a simmer. 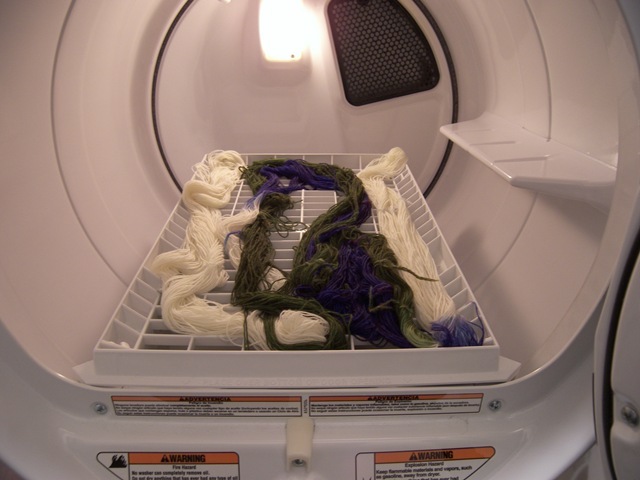 Drain the yarn and squeeze lightly to get rid of the excess water. Find your color segment markers and put the yarn in the right pots based on that. You can see my undyed/cream sections are carefully held up and out of the way by the strategically placed pot handles. If you had more colors, obviously the yarn would be in more pots or jars, etc. Let the yarn soak until the color is just right. I think I left the green in a little too long, but I’m really happy with the purple. Carefully remove the yarn (it’s hot!! Use tongs!) and rinse in cold water. The purple didn’t bleed at all, but the green did quite a bit (probably because I put too much dye into the pot) so keep the color segments separate until the rinsing is complete! Squeeze the yarn gently to remove the excess water. You can hang the skein up somewhere to dry, or you can use my favorite cheat. If your dryer has a shoe/sweater rack, stick the yarn on that and set on med/low heat! Only takes about an hour instead of the hours it could take yarn to dry. And it’s safe from children and pets, which is a nice plus. 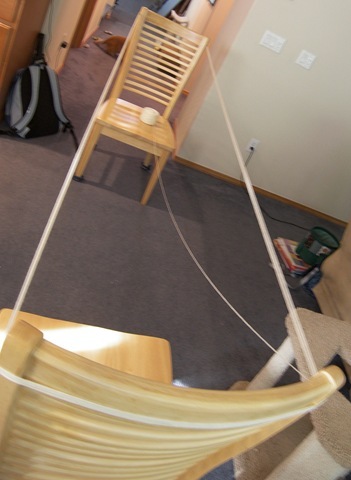 Put your dry yarn back on the skeining track from earlier (or anything similar that will keep the skein from tangling.) 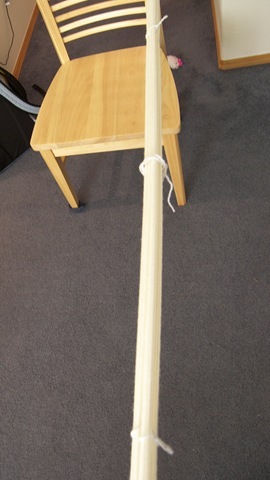 Remove all the ties and re-skein the yarn into something that will fit on your swift (I don’t have a niddy-noddy, so I used a piece of cardboard) or wind into a ball directly. Admire the pretty new yarn! Oh yeah, I saved some of the undyed yarn and made a little mini-skein to dye at the same time for coordinating cuffs/heels/toes. Check it out, stripes!! (As you can tell by the lack of ribbing, this is just a test swatch, not the actual sock.) Tip: Start your project at the beginning of a color segment (this swatch starts halfway between cream and green) so that the stripes line up correctly. I’m so excited to knit these socks!